1999), Explorations of the Laffer curve, Wurzburg Economic Papers 99-09. Partly because of the connection of the Laffer curve with considerations about distribution versus efficiency, economists have attempted to calculate the top of the Laffer curve. Today's Republicans tend to take pleasure when the Laffer Curve is vindicated and more money flows into government as a result of tax cuts. In other words, complexity, which requires attention and threatens boredom, is antithetical to both the Laffer Curve and the Spackman Initiative. This is reflected in the declining slopes of the tangents to the Laffer curve as the tax rate increases from t (1) to t (2) to t (3). In discussing progressivity and drawing on the Laffer curve (or as an MSc student of mine recently commented 'you're having a Laffer') soaking the rich does not generate anticipated revenue and only increases incentives for avoidance, begging the question: does CGT only really exist to serve as a barrier against income tax avoidance? Laffer, "Father of Supply-Side Economics" and inventor of the Laffer Curve, will be an economic advisor to the firm's investment committee and executive management team. When you make your main claim in the introduction that your paper "reveals a relationship" between the Laffer Curve and the dynamics of hedge funds, I'm not quite sure if you're saying that the Laffer Curve helps explain how hedge funds operate, or if you're saying that examining hedge funds tells us something about the concept of the Laffer curve. He contends that the Laffer curve was just a back bending supply curve, and that the Reagan tax cuts which were based on it were failures. Suppose we are on the upper part of the Laffer curve. 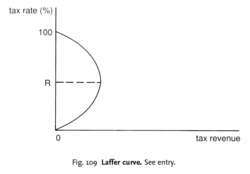 The Laffer Curve is also popularly associated with Republican politicians. Professor Arthur Laffer, of Laffer Curve fame, argues that taxation is the single greatest destroyer of motivation.